Ballard Corners Park | Where's my backpack? Walking through the Seattle neighborhood of Ballard recently, I happened across a most unusual sight. Tucked into the corner of Ballard Corners Park, a small little pocket park on the corner of 17th Ave NW and NW 62nd, I spotted a comfy looking sofa and armchair with a small table and lamp. It looked for all the world like someone’s living room transplanted into the great outdoors. At first I thought someone was in the process of moving house, but could see no sign of moving vans around. I ambled over for a closer look and realised the entire living room set was actually made of concrete. It is the work of local stone mason and concrete artist, Nathan Arnold and provides the most delightful alternative to a park bench. I couldn’t resist taking a little time out to sit and watch the birds play from the confines of the concrete couch – it was surprisingly comfy! This entry was posted in Photography, Travel, United States, Washington and tagged art, inspiration, photography, photos, pictures, travel, writing. Bookmark the permalink. I love it! Simple, imaginative–and surprisingly comfy. Awesome. I have friends who live in Ballard, I’ll have to go check this out when I visit them. Love it. Must make people see this corner of the park in a whole new light – pun unintended; or maybe not. Awesome! 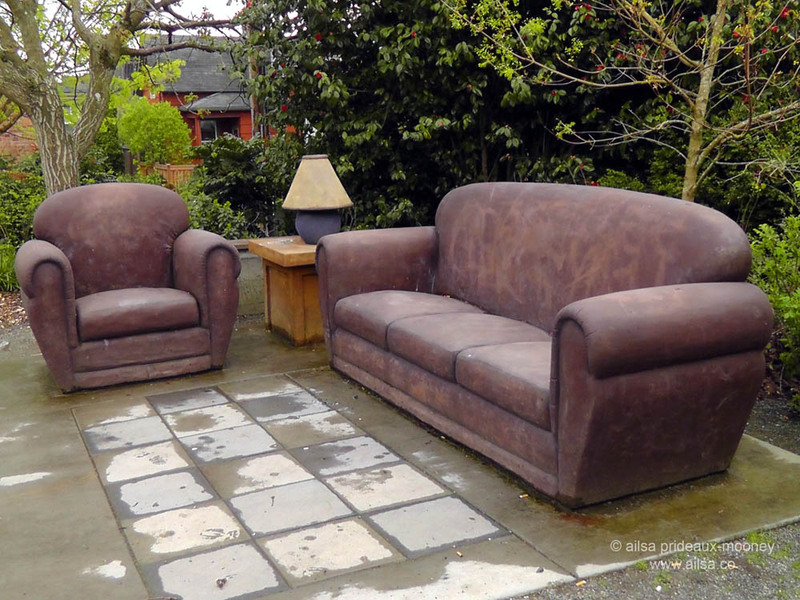 When I first spied your header, I thought how can any leather furniture survive outside – no matter the climate! I think I guessed the answer before I finished reading your post! How unique! And What fun! It really is fun, Darla, Seattle is filled with whimsical gems like this. I love this city. Seattle is one of my dream destinations to go and photograph. Who knows if it will ever happen, but I keep the dream alive. What a wonderful find! The sofa and chair look very much like what is in my house in Arizona, except mine are a bit softer, I would guess! I certainly hope your sofa’s softer, Margie, and hopefully a little easier to move too! I love this! My first thought was how in the world can furniture survive with Seattle rains? I think this is a great idea and am glad you stumbled on this park. Me too, I was thrilled that I discovered it, hidden away on a little back street. I love utilitarian art. Am glad that it is not only visually pleasing but one can really rest their weary body on it. Very cool! just don’t go over and plop down, thinking it’ll be all cushy! You live in a VERY interesting city! Love this. I’m a sucker for the play between indoor space/outdoor space – real or perceived. It’s great, I’ve seen similar but nowhere near as good! Wow, …was made of concrete! I was just in Ballard – Thursday evening last week – my colleagues and I went to the “Walrus and the Carpenter” for dinner. We had to wait an hour to get in, but it was worth the wait especially for my Norwegian colleague who was very keen on oysters. We seemed to be the oldest people there – apparently, it was very trendy! Such whimsy! Kinda puts humans in their place in nature? Welcome. Sit down and visit for a while? Open invitation. I think there’s something in the air off the West Coast that brings out this sort of delightful whimsy! Thanks for sharing. is there a TV in front? Wow, I used to live 2 blocks from the couch..until last year! We still have friends who are only a block away. Cool, isn’t it! 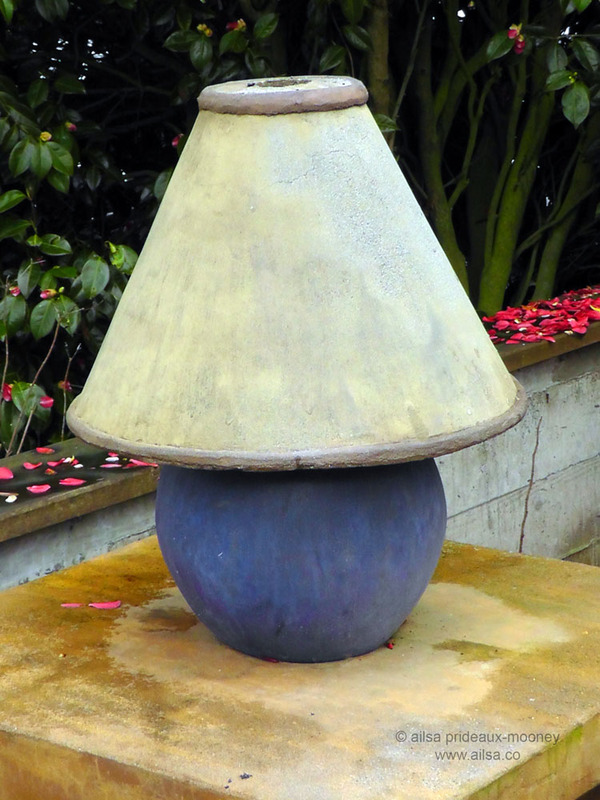 ever thought of making this for your garden? I used to live on Vancouver Island and made it down to Seattle a few times. If I ever get back, will definitely look this up! thanks! I love this. And smart on behalf of the artist – free advertising while beautifying the neighbourhood and creating something really quite unique. How many could actually resist sitting on it, at least for a moment?